The fourth largest city in the state of Maine is South Portland. The city is part of Cumberland County and has a population within the city limits of 25,002. The city was founded in 1895 along the Portland Harbor overlooking the magnificent view of Portland and the islands off Casco Bay. The city of South Portland has a total area of 14.02 square miles. Only 11.99 square miles are actually landing based while approximately 2.03 square miles is waterways. The city is bordered by Cape Elizabeth and Scarborough to the south and Portland to the north. Westbrook represents its border to the west. Settlers first came to the area in 1630 to establish farmlands. The communities grew quickly as more families came to recognize the beauty and utility of the land. Although it has a similar name, South Portland is a distinct and separate entity from the city of Portland. It is considered a principal city within the Metro area. Constructions of homes in South Portland it several milestones over the years. The period between 1920 in 1939 exhibited a building boom. Approximately 20.6 percent of current homes were built during those decades. Homes built between 1940 in 1959 represent 23.8 percent of the homes currently in use. Between 2000 and the present day 9.4 percent of the homes constructed in the city were made available. The average home in South Portland was built in 1949 with the median home square foot floor plan of 1306 square feet. Although single-family units represent 76.3 percent of residential inventory, condominiums are well represented in the city (15 percent) while 8.7 percent of domiciles are represented by other forms of construction. The median cost per sq. ft. in South Portland is currently $171. This list price is greater than the current Portland metropolitan area average of $165. 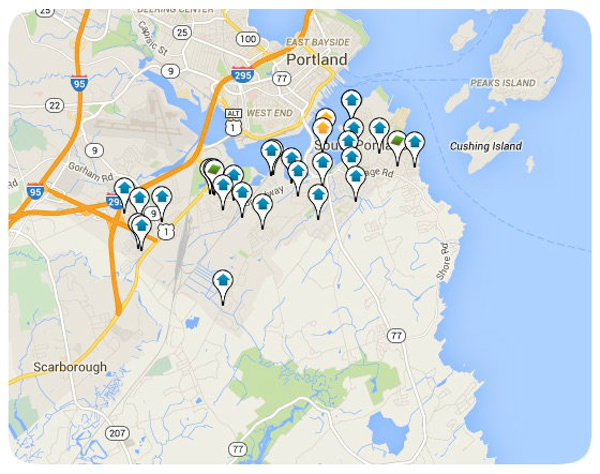 The median price of houses currently being listed in the South Portland area is $209,900. However, the median cost of homes that are being sold is $223,842. Listing courtesy of Maine Home Connection.